Hope Is My Anchor: Look what my BABY did at camp!?!?!?! Gives me the shivers, LOL! 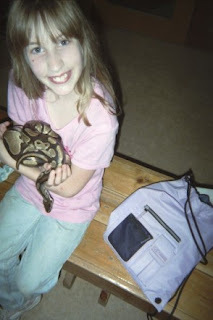 I have TOUCHED a snake...but never CUDDLED one!! I don't even want to pet a snake!! Yikes! Oh My! What a brave girl!! She says they told her the snake was ticklish too, LOL! I'm sitting here SL blogringing and my husby walked by and saw your pic on the screen and he said, "How are they doing?" I said, "Do you *know* them?!?" And he goes, "Yeah, he's got lyme's disease, right? Are they doing okay?" Unfortunately, I haven't been around enough to know how things are for you and yours...so, how can we pray for you?